I believe my previous post helped you to setup Apache Axis2 on windows. Now let's have a look at how to host a simple Web service with Apache Axis2. Start an eclipse project and write a simple java class which will output a string "Hello!!!". 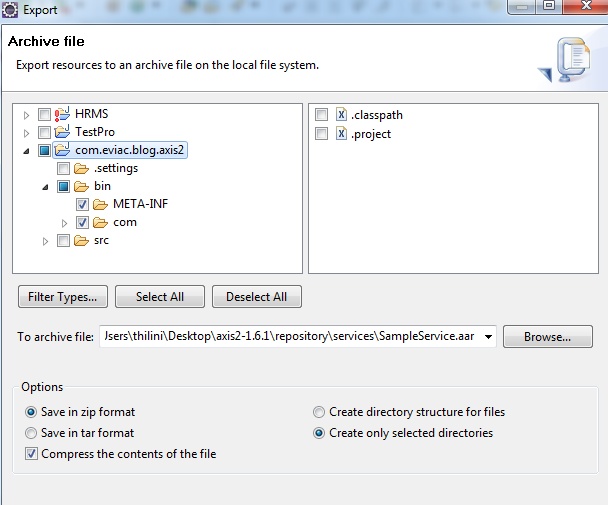 Inside src folder of your eclipse project create a new folder called META-INF and create a new file called services.xml in it. Using Eclipse build the project and export only the relevant package and the META-INF inside bin folder as an archive file(.aar) to the repository\services folder inside axis2 home folder. Start Axis2 server by double clicking on axis2server.bat inside bin folder. Now it will show deploying your service. Now fire up a web browser and paste the following address in address bar http://localhost:8080/axis2/services/. It will list down the deployed services. Now your service should also be in that list. Goto bin folder inside axis2 home folder using command prompt and run the following command. Make sure you have set Apache ant bin folder to environment variable path before using this command. It will create a folder called build inside it there will be a folder called lib and mywebservice-test-client.jar will be generated inside it. 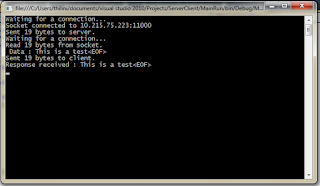 You must use mywebservice-test-client.jar as an external jar file in your client project. Not only that jar you must add another set of external jar files in to your client project. All those jar files reside in lib folder inside axis2 home. Here I have list them out. Now you can write the client code. Build the project and run it. 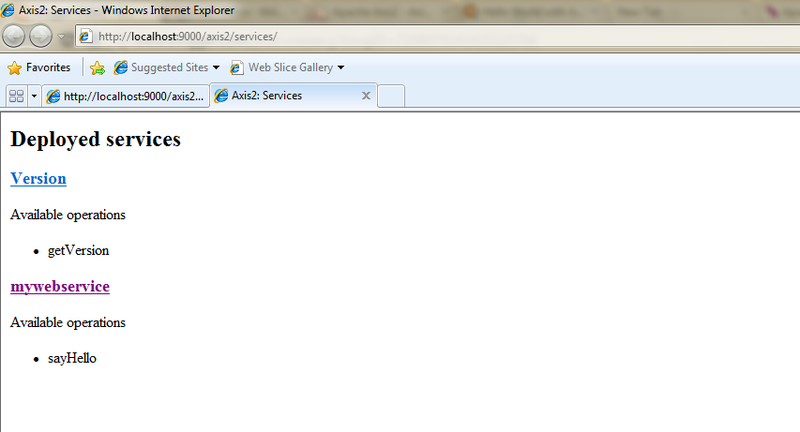 Make sure you have started axis2 server when you run the client. Note: in axis2 home inside conf folder there is axis2.xml file open it and set hotupdate="true", this will auto update axis2 service whenever you update an already deployed service without restarting the axis2 service. 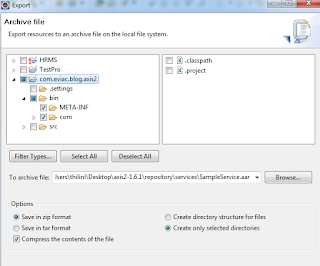 Download Apache Axis2 and extract the downloaded zip file to a desired location. 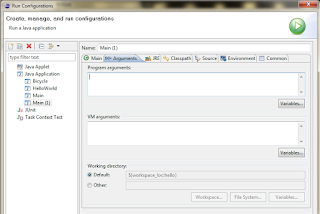 Make two new environment variables set first one's variable name as AXIS2_HOME and variable value as path to Axis2 home folder(in my case it is C:\Users\thilini\Desktop\axis2-1.5.4) and second one's variable name as JAVA_HOME and variabale value as path to Java home folder(in my case it is C:\Program Files\Java\jdk1.6.0_16). Goto bin folder inside Axis2 home folder and double click on axis2server.bat file to start Axis2 service. Now it's time to test whether installation is successful or not. 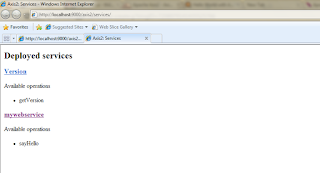 Just fire up a web browser and paste the following address in address bar http://localhost:8080/axis2/services/. If installation is successful it will list down a service called "Version". Arguments and return values of remote methods must be either primitive or serializable(Strings, arrays, collections etc), if passing self defined types be sure to implement serializable interface to the class. Implement the Remote interface created earlier. As the super class UnicastRemoteObject's constructor throws a Remote Exception it is necessary to write a no-arg constructor that declares a Remote exception in our class. Runrmic on the remote implementation class. To do this use the following command: rmic MyRemoteImplementation. This will create MyRemoteImplementation_Stub.class which is going to be the client helper. Note: Server should have following three classes to work. Note: Client should have following three classes to work. Client does a lookup on the RMI registry and RMI registry returns the stub object. Stub pretends to be the real service and let client invokes the method in it. I believe my previously written "JDBC" post has given you a basic idea to start JDBC in a windows environment. So here I go again under the same topic but this time the post will be limited to a code. In previous post I have given codes to create a database dynamically and connecting to a database. 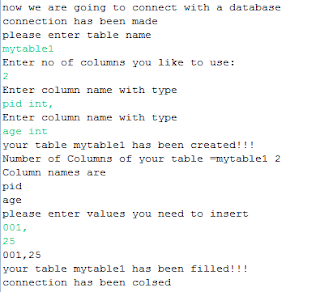 This code shows how to create tables inside that database and inserting values dynamically into that newly created table. st.executeUpdate("insert into " + tableName + " values" + "("
What are the pre-requirements for starting JDBC? There is another way to start stop mysql on windows,right-click MyComputer manage-->Services and Applications-->Services find MySQL and toggle start stop or restart. 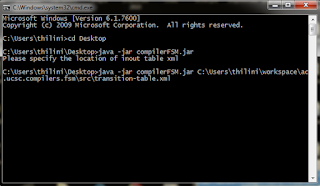 After downloading connector/j the mysql-connector-java-5.1.14-bin.jar file can be used as an external jar file to the JDBC project. Please refer previously written post about adding external jars for java or post for adding external jars in eclipse. JDBC(java Database Connectivity) is Java application programming interface that allows the Java programmers to access database management system from Java code. // of JDBC drivers. Each driver has to be register with this class. // resources occupied by the database. 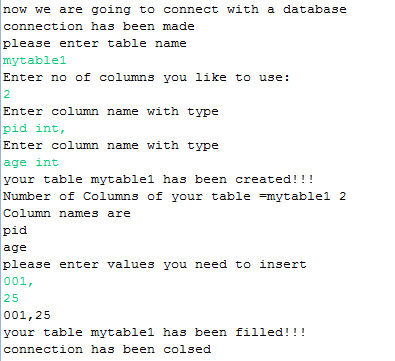 Note that newly created databases get saved in C:\ProgramData\MySQL\MySQL Server 5.5\data. 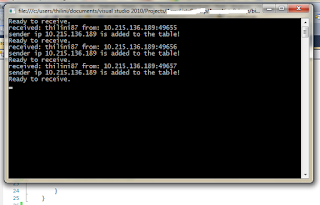 In C# the Socket class supports IP multicasting by using the SetSocketOption() method of the socket. MultiSend.cs program is created to send multicast packets across network boundaries. when the multicast packet is sent out, it has a TTL(Time To Live) value of 50, allowing it to traverse up to 50 hops before it is terminated. You can use the MultiRecv program to watch the multicast packet go out on the network. String s = employeeName + "@" + employeeNo + "@" + groupNo + "@"
Here is the way for $subject. Note: if you need to invoke a main method of another class it should be done through the name of that particular class as main is a static method. This post is related to the previously written post Network Broadcasting with C#. Consider the Broadcst.cs and RecvBroadcst.cs programs which were provided in Network Broadcasting with C#. In this post those two programs have slightly modified to achieve a special target described in the next paragraph. Suppose a peer to peer environment. When a peer connected with the network it continually listens to one specific port and as well sends a broadcasting message in every 5 seconds to the same specific port to inform it is connected. That broadcasting message will be listened through the modified RecvBroadcst.cs program and it will also store the ip of the sender in an Arraylist.Broadcast message is sent through modified Broadcst.cs program. Program.cs is used to run the two threads. Run these codes in visual studio. Nested class is a class within a class.A nested class is a member of its outer class. Nested classes can be declared public, private, protected. Static nested classes cannot access member variables of it's outer class directly. it can use them only through an object reference. Inner classes can access member variables of it's outer class directly even their access modifiers are private. IP broadcasting is used by network devices to send a single packet of information that can be accessible by every device on the network. Because TCP communication requires that two devices have a dedicated connection, it is not possible to send broadcast messages in a strictly TCP environment. Instead, UDP packets must be used because that protocol has the capability of sending messages without a specific connection being defined. The Broadcst program creates two separate IPEndPoint objects, one using the IPAddress.Broadcast address and one using a local broadcast address 192.168.1.255. Next, the local hostname of the device is determined using the standard Dns GetHostName() method, and it is sent out in two separate broadcast messages. The RecvBroadcst program is a simple UDP program that creates a socket and binds it to all network interfaces on the device, using port 9050, the same port that the Broadcst program uses to send its broadcast messages. After binding the socket to the UDP port, the program attempts to receive two messages sent to the port and displays the message and the sending host address information. 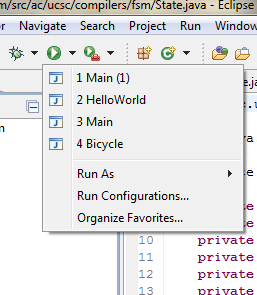 In Eclipse beside the "Run" button there is a downward arrow. Click on it. In the drop-down menu click on "Run Configurations". 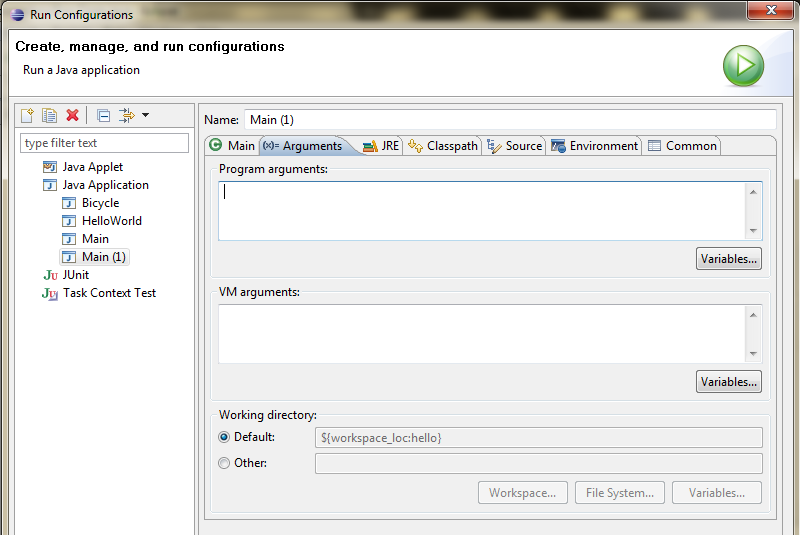 It will open a new window "Run Configurations", there select the required project. Goto "Arguments" tab and inside "Program arguments" text area type command-line parameters separated by a space. 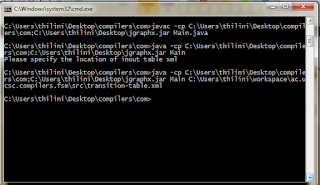 I had a problem with compiling and running a java file in command line where it imports an external jar files. Here is the solution I've found. 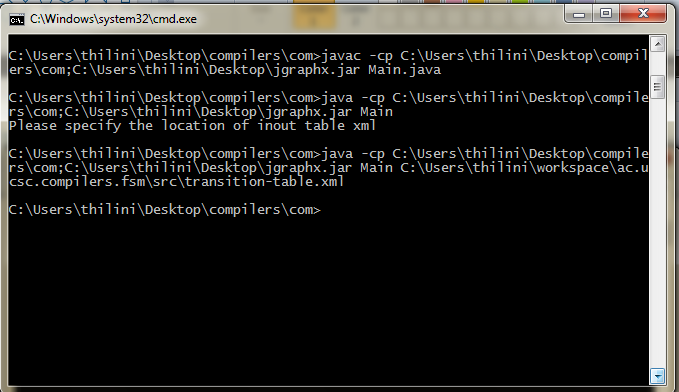 Go to the directory which jar file resides using the command "cd". 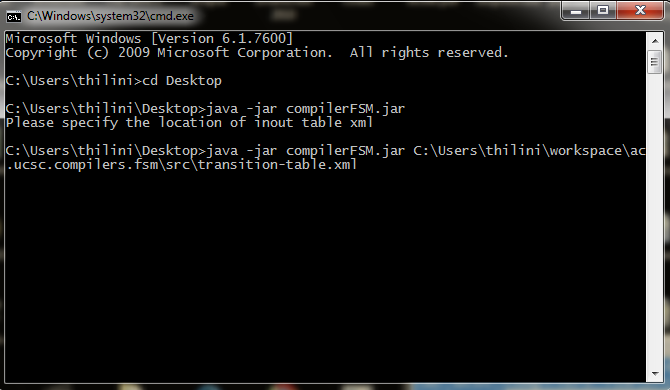 Type the following command to execute jar file with command line arguments. // Data buffer for incoming data. // There  might be more data, so store the data received so far. // client. Display it on the console. AsynchronousSocketListenerns.cs creates a server that receives connection requests from clients. 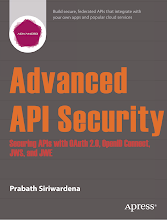 The server is built with an asynchronous socket, so execution of the server application is not suspended while it waits for a connection from a client. 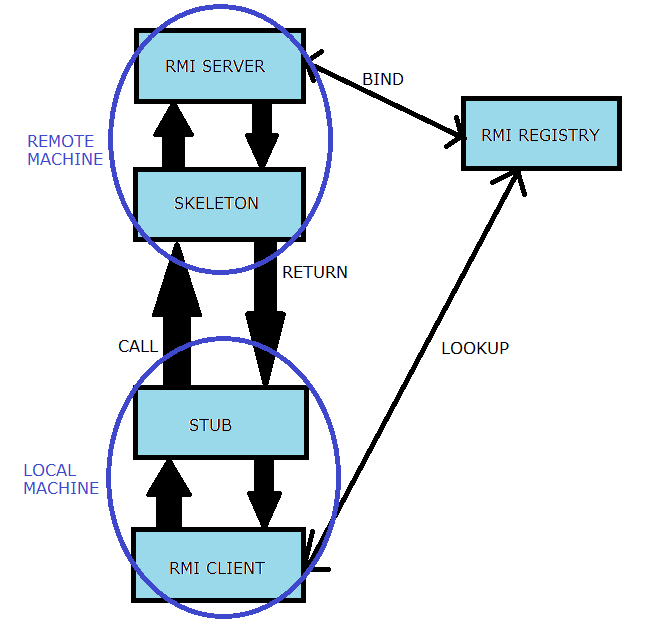 The application receives a string from the client, displays the string on the console, and then echoes the string back to the client. 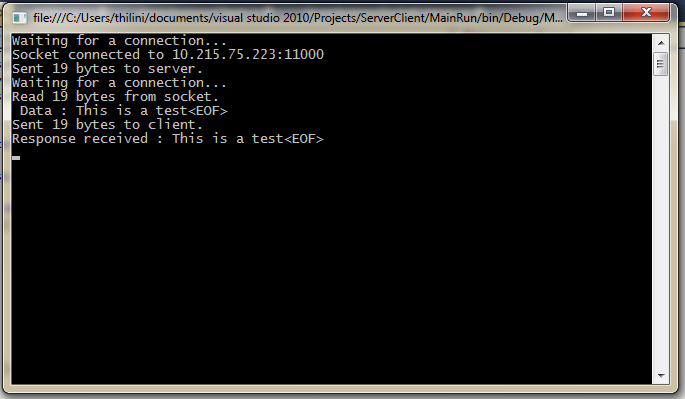 The string from the client must contain the string "<eof>" to signal the end of the message. AsynchronousClient.cs creates a client that connects to a server. As client is built with an asynchronous socket, execution of the client application is not suspended while the server returns a response. 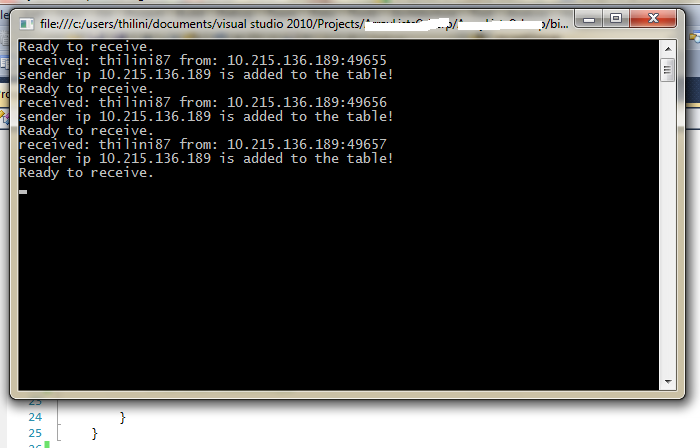 The application sends a string to the server and then displays the string returned by the server on the console. StateObject.cs is used for reading client/server data asynchronously. MainRunns.cs is used to start a server thread and a client thread. Following code shows how command line parameters can accessed in C#. The Length property is used to obtain the length of the array. Following expanation will be a guide on building and running the code within Visual Studio. 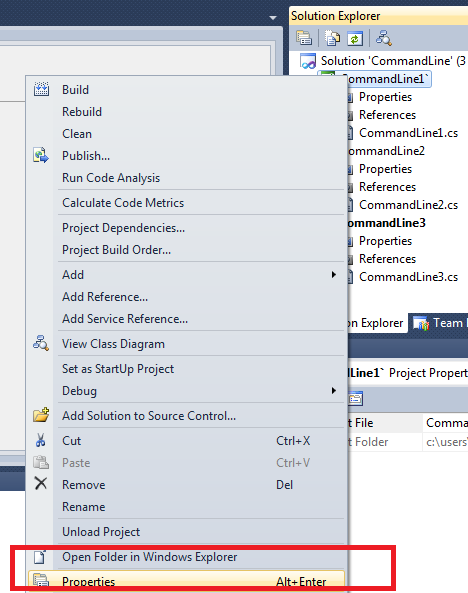 Right-click the project(in the above example CommandLine3 will be the project) and click Properties this will open up Open the configuration Properties window and click Debugging tab. The exec family of functions shall replace the current process image with a new process image. 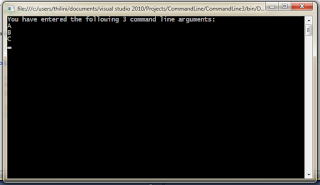 A command (with the path to the command e.g /bin/ls) and the required arguments are passed to the function. "arg0" is the command to be executed. Function arguments are null terminated strings(The list of arguments is terminated by NULL). A command (path to the command will be resolved by the function itself) and the required arguments are passed to the function. "arg0" is the command to be executed. Same as the execl function except now the arguments will be passed into a null terminated char pointer array. "arg" is the command to be executed. Note: By changing href attribute inside <a> tag and src attribute inside <img> tag(which will be the relevant icon for the link), it is possible to create a button in blogger to redirect into any required public profile. System call fork() is used to create processes, the newly created process will be the child of the calling process parent. Unix will make an exact copy of the parent's address space and give it to the child. Therefore, the parent and child processes have separate address spaces. if PID < 0, fork() returns a negative value, the creation of a child process was unsuccessful. if PID ==0, fork() returns a zero to the newly created child process. 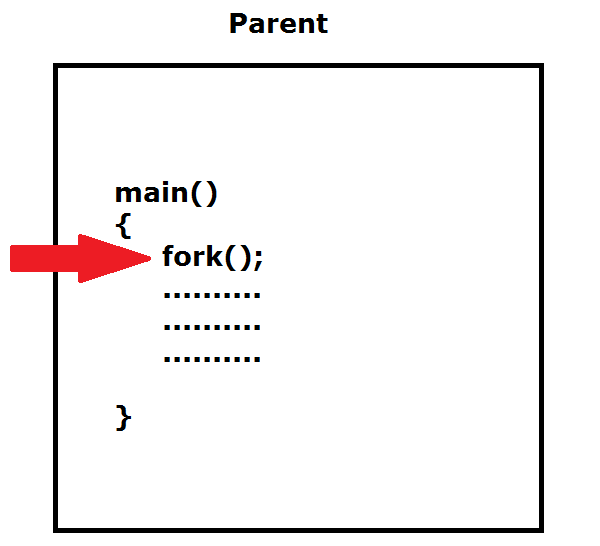 if PID > 0, fork() returns a positive value, the process ID of the child process, to the parent. After a successful call of fork(),unix makes two identical copies of address spaces, one for the parent and the other for the child. Both processes will start their execution at the next statement following the fork() call. 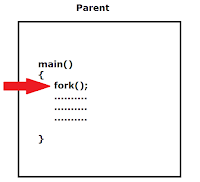 Variables initialized before the fork() call have the same values in both address spaces. Modifications done in each process will be independent.